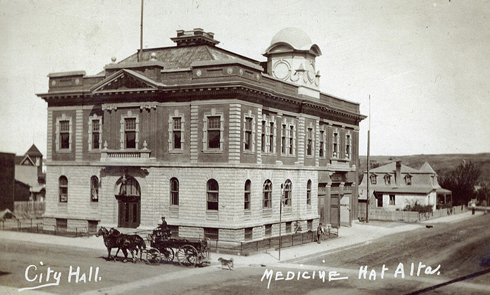 Prior to my fascination with the history of Medicine Hat this year, I'm sure I saw a few pictures of this building in passing. The truth is that I never gave it much thought, mostly because I didn't recognize it or realize what it was. 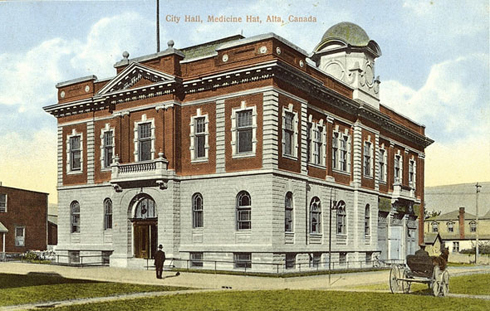 It wasn't until I started going through various online archives that I realized this was the original Medicine Hat city hall and fire station, and that it was demolished in the early 1980s right before I was born. 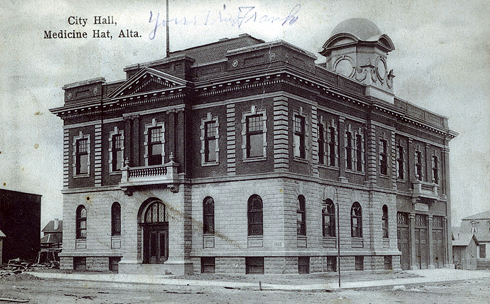 Today the location of the former city hall is better known as B.A.T.U.S. 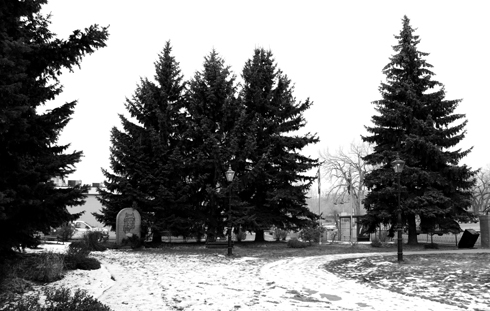 park (after the British Army Tactical Unit Suffield - the nearby Canadian Forces Base), on the corner of 2nd street and 6th avenue just across from the old Canadian Bank of Commerce building. 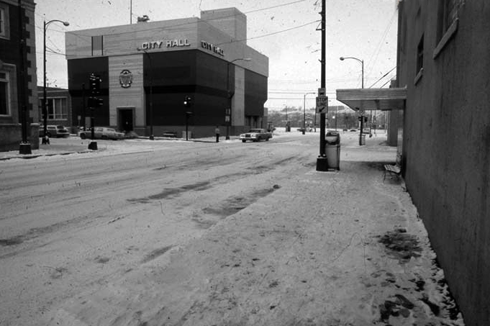 In fact, if you check out the photo set I did of that location you can see more archival images of this corner. 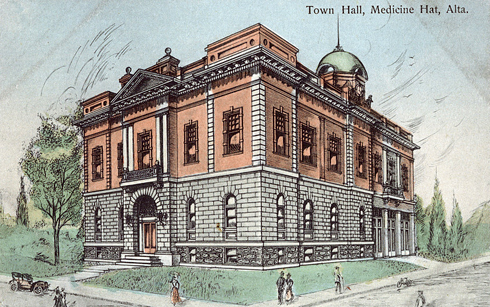 The loss of the old city hall is unfortunate, but the decision came after years of debate about the building not being large enough and its worsening condition. 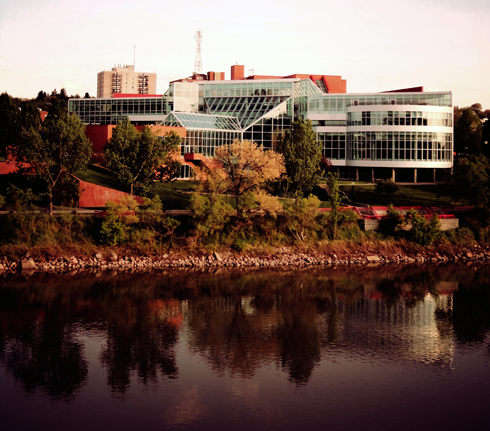 In 1983 (Medicine Hat's centennial year) the new city hall was built just a block over along the bank of the South Saskatchewan river. 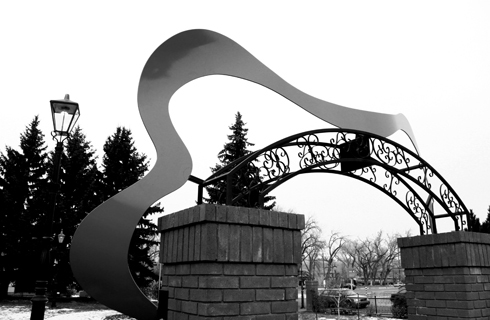 Thankfully, the city council was brave enough to agree on a bold and modern design. City council wasn't always quite so successful in their decisions however. 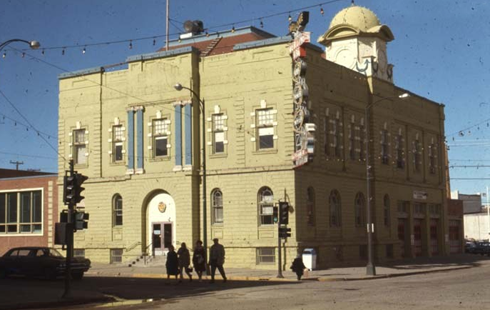 Between the late 1960s and early 1970s, in one of various attempts to spruce up the aging city hall, they decided to paint the entire building (in what I can only image was vomit inspired) green. There was no way that was going to age well. 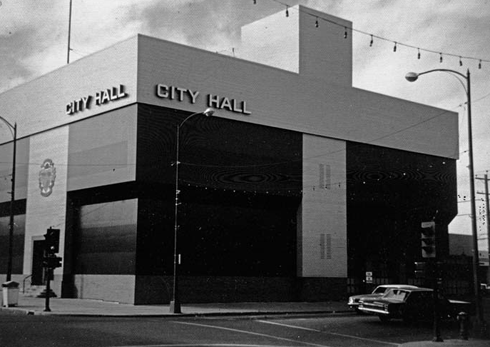 Then in 1973, to give the illusion of a modern structure, and because I imagine people were getting ill from the colour, the building was covered entirely in metal panels that further stripped the building of its charm. Of course, the facade did nothing to help the interior, which my mom recalls from her brief time working there, "only made the offices darker". By the time talk of demolition started, I imagine many cringed at the thought of how much it would have cost to try and restore this Frankenstein of a building. 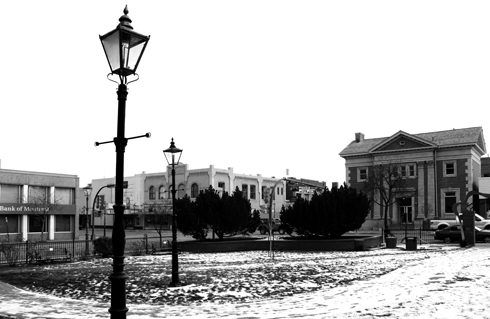 In the end, I found it fascinating to uncover the evolution of this space, and how despite seeing this park regularly, I knew almost nothing about it. 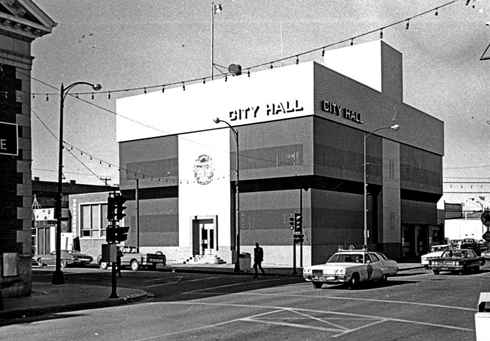 I didn't even see a historical marker in the park saying that the city hall used to be there. 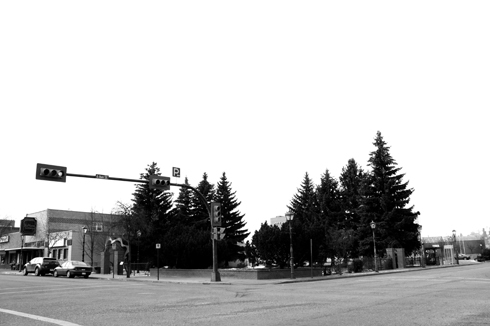 As it was, this corner in downtown Medicine Hat used to be a pretty significant place. 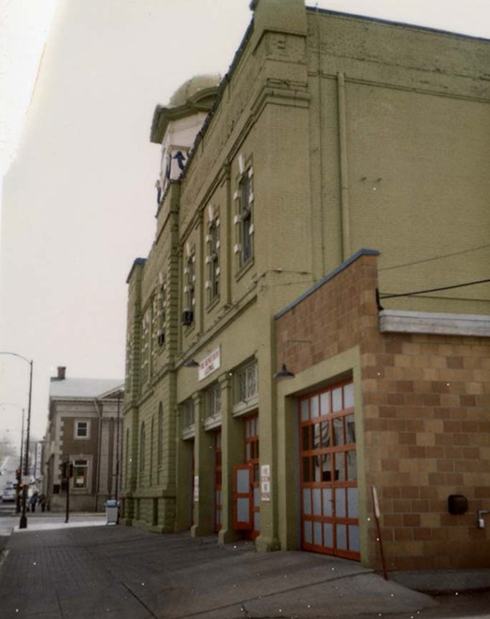 It was the central fire hall and seat of the local government for over seven decades. 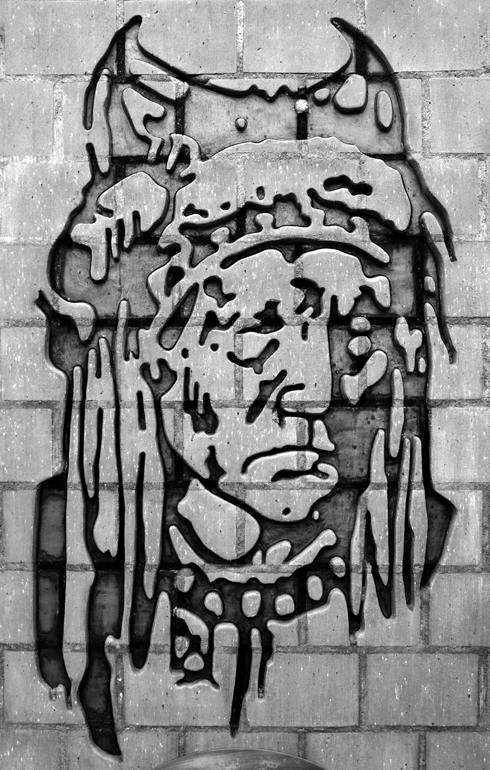 The city's medicine man icon in BATUS park.